This class will focus on patterns of disharmony associated with stress and anxiety as it is experienced in both the mind and body. 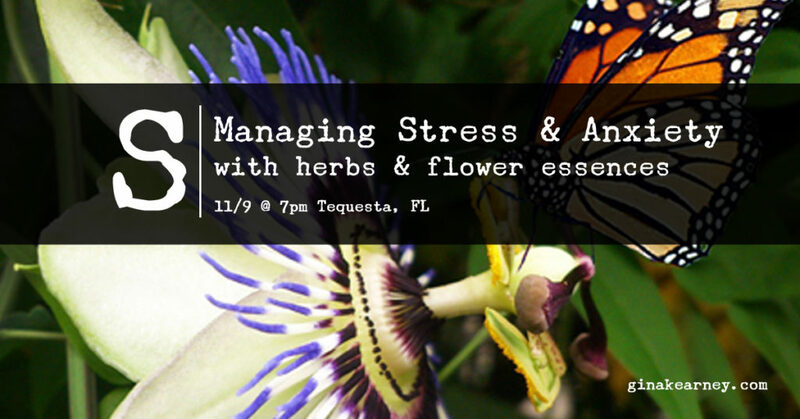 We will explore various Herbs and Flower Essences that have been shown to ease stress and anxiety and symptoms such as head and neck tension, nervous stomach, shortness of breath, rapid pulse, fear, cyclic thoughts, and general uneasiness. You will sip on a calming herbal tea and be shown how to make medicinal teas at home. You’ll also learn valuable breathing techniques to help calm and restore balance during times of heightened stress. You will leave with an understanding of each herbal remedy presented and the confidence to manage your personal stress and anxiety whenever the need arises. Gina Kearney is a Certified Herbalist & Flower Essence Practitioner. She offers private Herbal and Flower Essence consultations by appointment at her office in Hobe Sound, FL. Visit http://ginakearney.com to schedule a consultation or to see her schedule of upcoming classes.